The Awesome is a fast Inner Sphere Assault Mech with a focus on medium to long range combat. The characteristics of the Awesome, with a lower price point and good speed for its weight class, may be better compared those of a Heavy Mech. 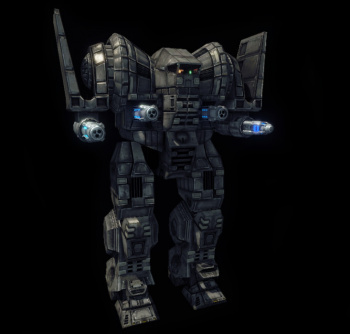 However, it distinguishes itself with exceptional armor coverage, featuring a smaller than average profile for it's weight class and more armor than even some Clan Assault Mechs. The Awesome's firepower is usually based on a heavy reliance on Energy Weapons, backed up by large arrays of Heat Sinks to enable it to lay down continuous barrages with little worry for ammo depletion or heat buildup. Combined with specialized Ballistics or Missiles, and its good speed and armor, the Awesome makes for a rugged and adaptable Mech. However, this is not without some weaknesses - The Awesome has a limited torso twist and somewhat poor maneuverability, leaving the Mech open to being easily flanked by fast vehicles. 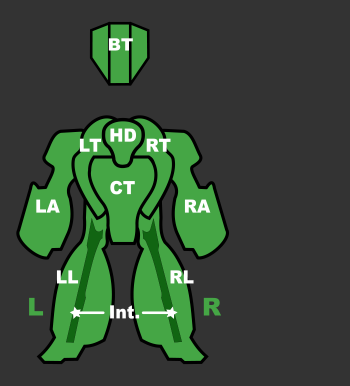 The Awesome also has a large head hitbox, and pilots should twist their torsos away from the enemy when not firing to avoid damage to this component. It should be noted that the Awesome's weapons are mounted in a horizontal line on arms and side torsos making it more difficult to render an Awesome combat-ineffective, but this also means that the Awesome can be vulnerable to enemy fire before it can fire back due to the relatively low placement of its weapons. The Awesome Prime carries a trio of ERPPCs as its main array of weapons, allowing the Mech to inflict serious damage out to 900m. The large burst damage and long recharge time for the ERPPCs allow the Awesome pilot to slip in and out of cover and deal damage easily, though pilots should be aware of the Mech's sluggish acceleration and opt to circle in and out of cover rather than moving backwards and forwards with the throttle alone. When caught in the open, pilots should torso twist away from the enemy in between ERPPC barrages to make best use of this Awesome's superior armor coverage. With an array of 11 Double Heat Sinks, the Prime can fire its ERPPCs nearly continuously, barely inching over the critical heat line. The Prime mounts a Beagle Active Probe, extending the Mech's radar range, allowing pilots to detect targets well before reaching firing range and giving them time to find a vantage point. Furthermore, enhanced optics allows easier sniping. At short range, the Prime can bring a Medium Pulse Laser and a Streak SRM4 to bear. While only a small deterrence to most vehicles, these weapons, along with B-Pod, help protect the Awesome against Battle Armor - A blast of four SRMs at a Battle Armor's feet as it lands are certain to kill it. One of the cheaper & least armored Awesomes, this variant is geared towards long range combat aided by its Enhanced Optics and is particularly effective against faster targets. Three ER Large Lasers forms the bulk of this Awesome's equipment, and can deliver highly accurate 1665.27 damage at a maximum range of 800m. This is backed up with a single LRM15, which can lock on to moving targets. These weapon systems combined allows this Awesome to easily deal considerable damage to lights and mediums, though requires some additional battlefield awareness on the behalf of the pilot - LRMs require time to lock on and travel to their target, who may enter cover before they arrive, and lasers require time on target to discharge their full damage potential. Thus, pilots should deploy this Awesome in open areas to make best use of its weapons systems. The load-out is rounded out by one LtGauss, which has a reach of 1250m and the lowest damage profile without the large heat build-up. This is fortunate, as the Mech's array of 7 Double Heat Sinks do not allow for continuous firing of the lasers as they stand. The B variant is a capable short and medium range brawler that can take on on heavier and more expensive Assaults. The mech's primary armament is a pair of Ultra AC10s. While possessing somewhat slower rate of fire than a single Ultra AC20, a staple armament on most short range brawlers, it makes up for the lost damage output with greater range, allowing it to place the first strike before entering short range combat. However, the slow rate of fire and relatively slow bullet velocity of the Ultra AC10 make shots on fast moving targets difficult. To remedy this, the Awesome B also mounts four accurate Medium Pulse Lasers that can sear off components on lighter vehicles with ease, and will cause significant damage to heavier armor as well. A Guardian ECM suite allows this Awesome to remain hidden until just before it reaches firing range, and protects the ungainly Mech against LRM assets. Five double heat sinks are adequate under most circumstances, though desperate firefights will require pilots to use small amounts of Coolant to stay below critical levels. This variant uses low-tech equipment and carries a simple but deadly loadout of four PPCs and an array of 14 Single Heat Sinks, making for a powerful mid-range support vehicle. The low heat of the standard PPCs (compared to ERPPCs or Clan ERPPCs) combined with the large array of heat sinks allow this Awesome chain-fire constantly, and permits patient pilots to alpha strike somewhat regularly. Pilots should opt to use chain-fire to maximise screen shake, reducing the enemy's ability to fire back and cause damage. Pilots should circle and angle their undamaged torso sides to the enemy while waiting for their PPCs to recharge in order to spread what damage the enemy manages to inflict. When operating as a support Mech for other Heavies or Assaults, the Awesome C should make use of its Guardian ECM suite or Passive Radar and attack stealthily from the flanks. Pilots should be careful not to reach a critical heat level by firing too readily, as the heat spike will reveal their location on Radar. To counter this, pilots should use the time in between volleys to relocate to remain hidden, cooling down on route. The Awesome D is an inexpensive mid-range mech, capable against light and heavy targets. The primary damage dealer of the Awesome D is an MRM20, which while somewhat difficult to aim, can be very effective against large and slow targets such as other Assault Mechs. A pair of Large X-Pulse Lasers can whittle down armor at a decent range with accuracy and are more than sufficient to deter light assets from coming closer. Rounding out this Mechs loadout is a duo of LB-10X Autocannon, providing a decent amount of burst damage while generating little heat. While this array of equipment seems good on paper, in practice the varying projectile velocities of the different weapon groups can be difficult to manage, and pilots should have an engagement strategy based on range to their target to use the Mech effectively. For instance, at short range pilots should fire their MRMs and the LBX5's first before using lasers to ensure the most damage is dealt. Similarly, at maximum range pilots should avoid using the difficult to aim MRM launcher, reserving it for stationary targets, and instead focus on landing as many laser shots as possible. Another shortcoming being its 6 DHS as duo of Large X-Pulse Lasers generate too much heat for heatsinks to handle, let alone other weapons. The Awesome E is configured for extremely long range combat, boasting a pair of Light Gauss Rifles mounted in each arm and a pair of torso mounted ERPPCs. This Mech's Light Gauss Rifles enable it to strike targets from 1250m, out-ranging many other assets in the game, and a Beagle Active Probe enables pilots to identify potential targets at this extreme distance. Two additional tons of Gauss ammo allow the Awesome E to lay down a decently long barrage upon the enemy. At slightly shorter ranges the ERPPCs can provide powerful punch, useful for closing and knocking out targets after whittling them down with Light Gauss Rifle fire. Pilots should be careful using the ERPPCs too often though, with only 4 Double Heat Sinks to help dissipate the immense heat these weapons generate. This variant fares poorly at short range, as the long recharge time for its two weapon systems and its lesser armor can be exploited by assets carrying short range and fast firing weaponry. While its burst firepower is enough to dissuade most light vehicles, pilots should always opt to use this Mech at maximum range to avoid being jumped upon by larger assets, and use the Awesome's decent speed for its size to retreat into friendly formations once within 800m of the enemy. This Awesome sports a quartet of ERMBLs with range of 600m, and a single Gauss rifle reaching out till 900m. The dual LRM10s do decent damage up to 1000m. Avoiding any moot point, this variants key strength might lye in its 15,5 tons of armor. While the enemy is occupied in whittling it down, the pilot is advised to make and exploit any weakness in the foe - using it's best with the provided weapons. In any operation involving any more but a single unit - it is most probable that the Awesome will be the one drawing the heaviest fire from the enemy, buying the other units time to live. The selling point as for any Awesome, is it's staying power divided by the cost. The aptly named "Nutcracker" is a short-ranged Awesome variant with a specialty in breaking through the armor of enemy vehicles. At 700m the Awesome G is able to open up with a pair of torso mounted PPCs, useful for softening up damaged targets before closing to unleash a pair of deadly Rotary AC5s, which are able to turn the armor plating of even the heaviest tanks to dust in a few seconds. This combination of weaponry is extremely potent, as the Rotary ACs can burn through torso sides with focused fire, while the splash damage of a follow-up PPC blast can still hit destroyed torso sides even if the enemy attempts to hide their damaged components. Against heavier targets, pilots can exploit the screen shake caused by PPCs by chain-firing them with the Autocannons, maximising damage output while reducing the enemy's ability to return it. 4 free tons for Autocannon ammo allows the Mech to fire with impunity, though with only 7 additional low-tech Single Heat Sinks, firing the PPCs too readily will lead to dangerous heat buildup. Lacking any other electronics, the Awesome G is unsuited to flanking maneuvers. Instead, it should form part of a main battle line during base assaults, using its armor and tank-busting ability to destroy defending vehicles. B-Pod helps finishing off hurt Battle Armors. Originally designed during the Star League era, the Awesome is a powerful Assault Mech built around an impressive array of Energy Weapons. It can operate for extended periods of time both as a defensive Mech and offensive Mech because it doesn't rely on ammo. This allows it to win battles by bleeding it's enemies ammo stores dry. The Awesome as represented in MWLL is based off of the AWS-9M model introduced in 3049, just prior to the Clan Invasion. Featuring an upgraded XL engine and double heat sinks, the 9M was faster than the original 8Q model and replaced the original armament with three ERPPCs, two Streak SRM2s, a Medium Pulse Laser and a Small Pulse Laser. This page was last edited on 29 January 2019, at 22:28.